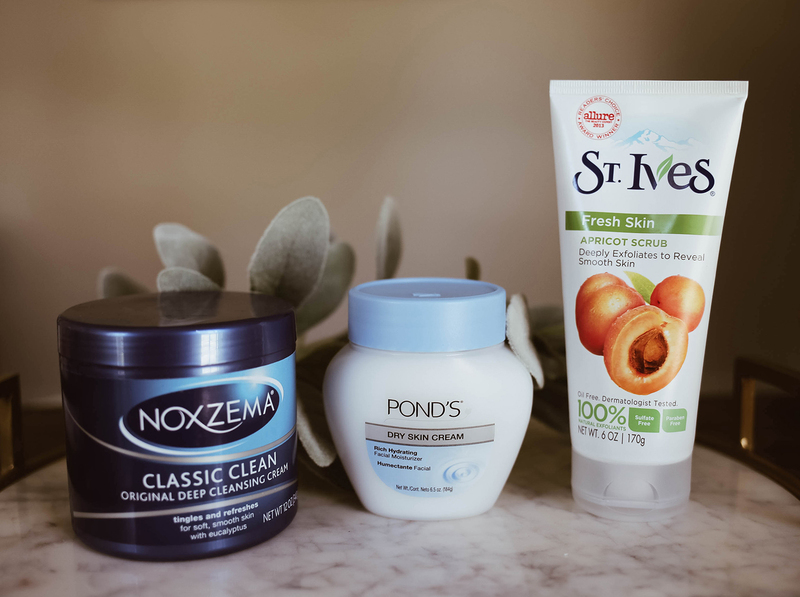 This post is sponsored by Unilever Brands: Pond’s, Noxzema, St. Ives and Simple but the content and opinions expressed here are my own. I’ll admit it, sometimes in the morning I am so rushed that I don’t even have time to brush my teeth before 10am. Thank the Lord for carpool drops off and the school bus so I don’t have to see anyone face to face before I’ve gotten ready. When I’m in a hurry or tired, I condense my skincare routine into something a bit more manageable. I don’t pre cleanse, add eye cream, toners or serums. I apply the absolute necessities to get me out the door (or into bed after a long day!) These four products provide the perfect skincare regimen to help save time. They are also all available at Walmart to make shopping easier and more affordable. Hallelujah! Step 1: CLEANSE – I never, ever go to bed without washing my face. Thinking about all the dirt and grim that has been on my face all day makes my skin crawl. I am also a big weirdo when it comes to dirt being on my pillow case but that’s another story. As important as it is to wash away grime at the end of the day, it’s equally important to wash your face in the morning too. At night when you sleep your skin’s sebaceous glands are producing oil. 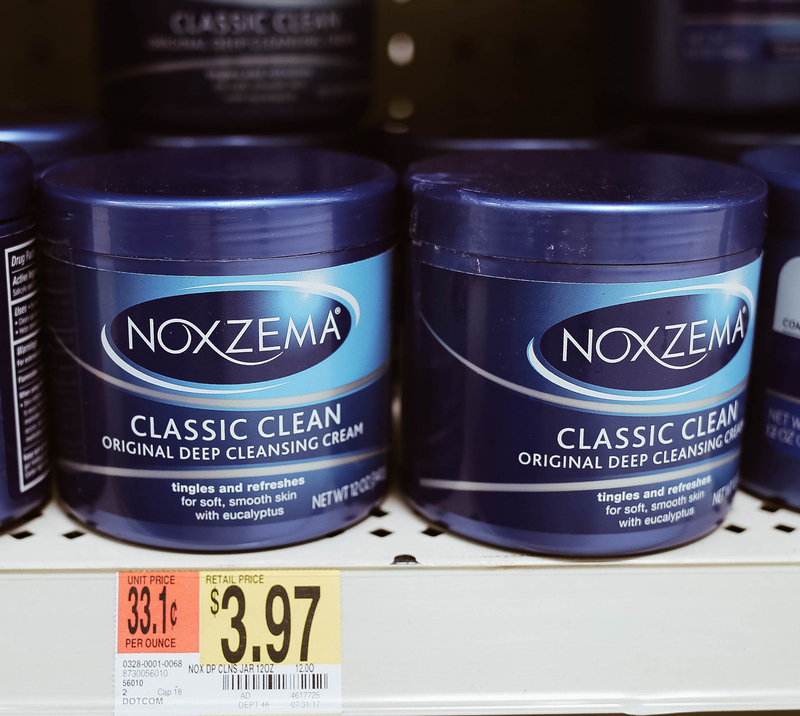 Noxzema® Classic Clean Original Deep Cleansing Cream is gentle enough for every day use while also removing dirt, oil and grime from your skin. 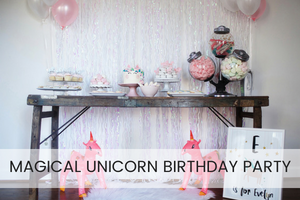 This is one of those brands that has been around for ages and has such a diehard following. Raise your hand if this was one of the first cleaning creams you used in your early teen years! 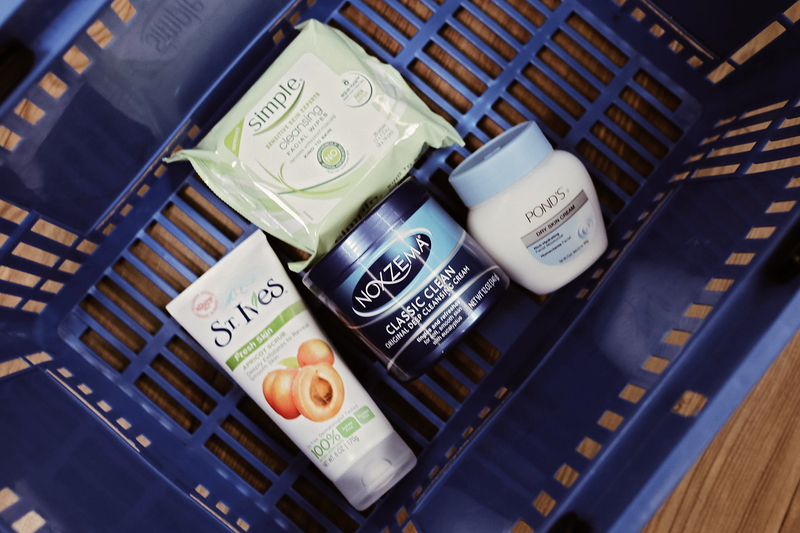 I love stocking up on new things to try and discovering some new skincare favorites. 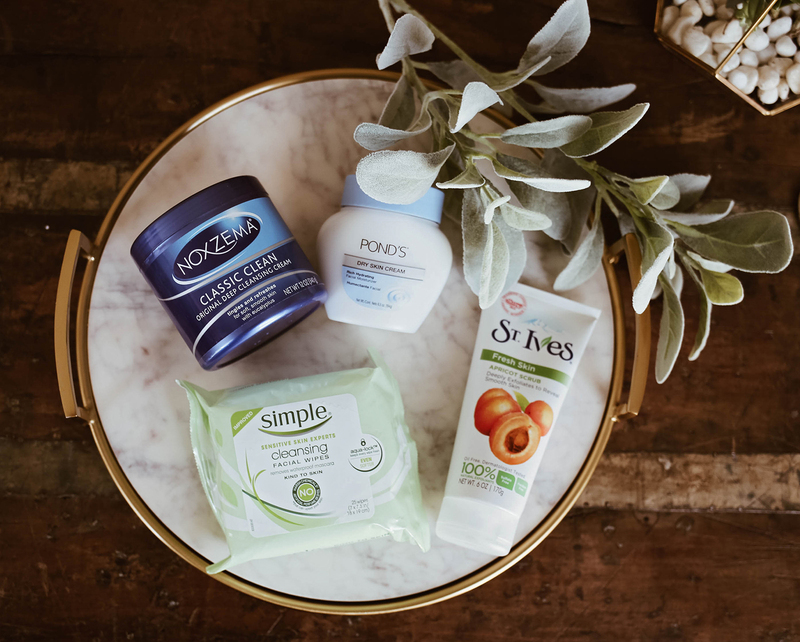 I recently tested out the Simple® Cleansing Facial Wipes and am a huge fan now. A lot of the facial wipes I have tried in the past can never remove my eye makeup all the way so I inevitably have to use eye makeup remover. When I’m seconds away from passing out in my sink at night, the last thing I want to worry about is using yet another product. The Simple® Cleansing Facial Wipes remove all my eyeliner and mascara without any residue left over and are perfect for removing excess makeup after cleansing. STEP 2: EXFOLIATE – Every time I get a facial I am reminded by the esthetician how important exfoliating it. Exfoliation is the removal of dry/dead skin cells from the surface of your skin. When you exfoliate on a regular basis (3-4 times a week), your pores size will decrease and your skin will be smoother and more glowy. 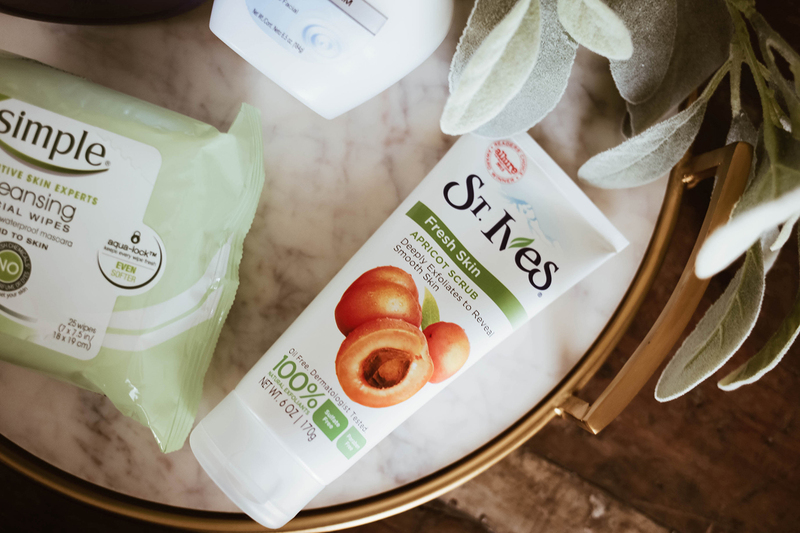 My current favorite exfoliate is the St. Ives® Fresh Skin Apricot Scrub. I’ve been using St. Ives products since I was in high school and they have never let me down. Their face scrubs have always been my favorite. After cleansing your skin thoroughly, gently exfoliating is a must. I usually exfoliate in the evening in case my skin pulls some redness afterwards. STEP 3: MOISTURIZE & ADD SPF – My final step in my skincare routine is always a great moisturizer followed by a SPF. 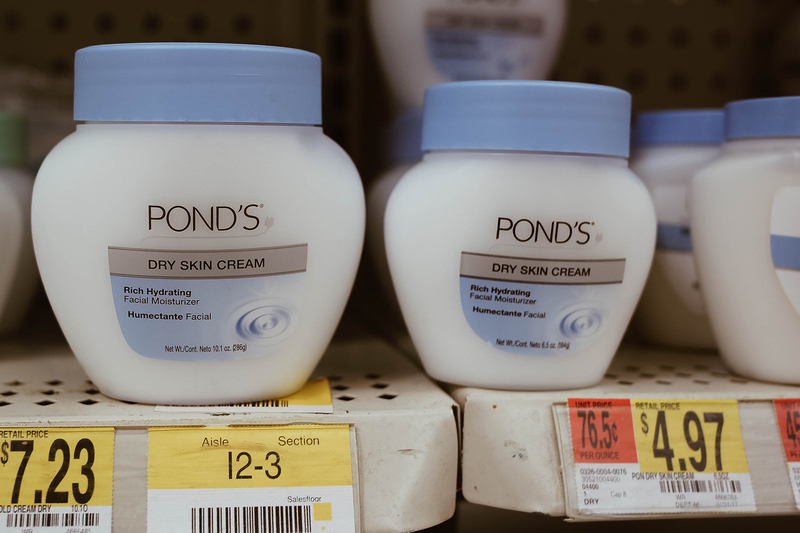 The PONDS® Dry Skin Cream does a really good job of hydrating my skin without ​it ​feeling greasy. This moisturizer is also dermatologist tested, hypoallergenic, suitable for sensitive skin and won’t clog pores. My skin has a tendency to break out if I use products that are too heavy so I love that this one soothes my skin without causing acne. 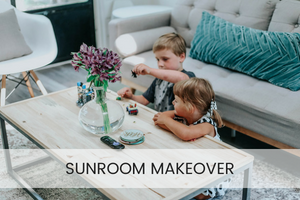 Don’t forget to add an SPF before going outside! Do you have any favorite skincare products that are your go-to? Let me know in the comments below! 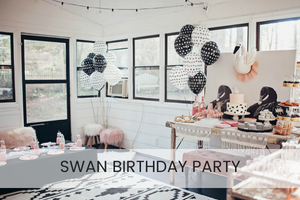 As a beauty and skincare junkie, I love hearing about products other people love! Amen to a quick routine! Unfortunately I have to put a face on for work everyday. If I didn’t have to go in to an office, I would NEVER wear makeup. Same girl! Unless I have plans, I never ever wear makeup! I always keep that apricot scrub in my shower. I never seem to have a moment to wash my face unless I’m in the shower! I use the same wipes, I love them! 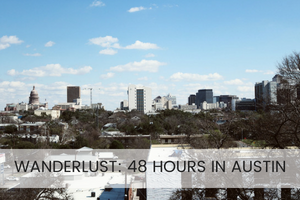 I’m all about quick routines and sadly I’m the same with brushing my teeth in the weekends. 🤦🏻‍♀️ That St Ives scrub sounds pretty awesome. I love exfoliating my skin and the way it feels after. Ooo I haven’t used Nozema in years! I am so pleased to find that they’re still around. Cannot wait to grab a tub of that cleansing cream! These are all great products. My grandma swears by ponds and uses it daily. She also looks about 20 years younger than she is so they are definitely doing something right! Love your photos, so pretty! 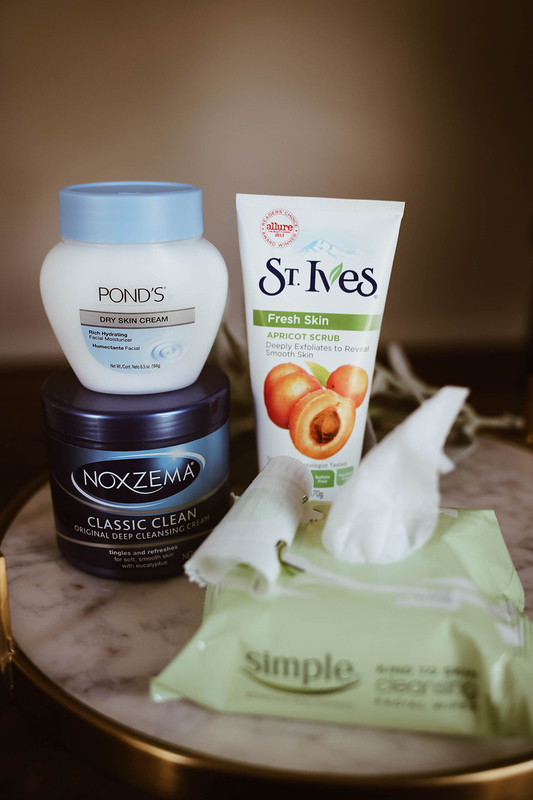 These products are great for a no-nonsense skincare routine, especially if you are busy in the mornings! Thanks for sharing! Great products! I especially love the St.Ives! These are seriously such classic and must have beauty items. 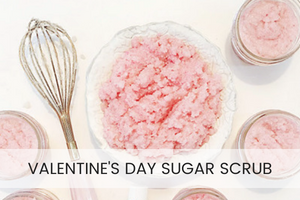 That St. Ives scrub is my fave! 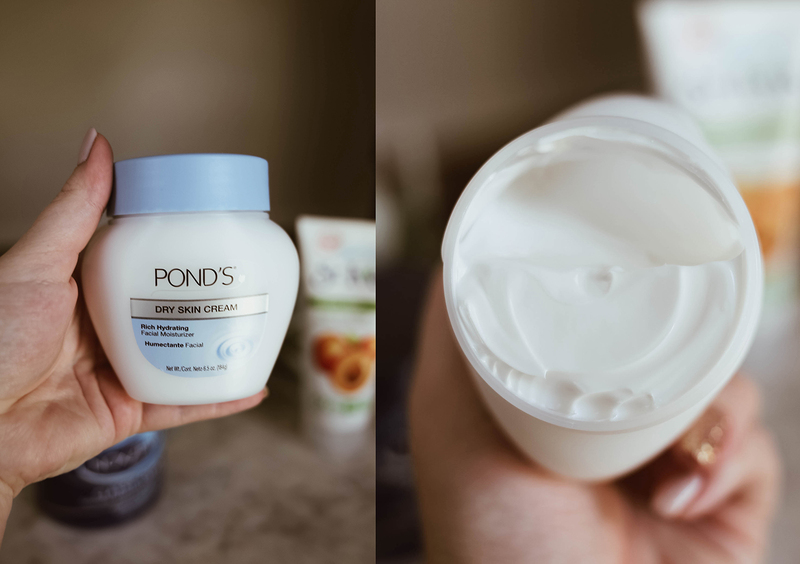 Pond’s and Simple wipes are staples in my routine! I used to use Noxema a ton as a teenager, too! 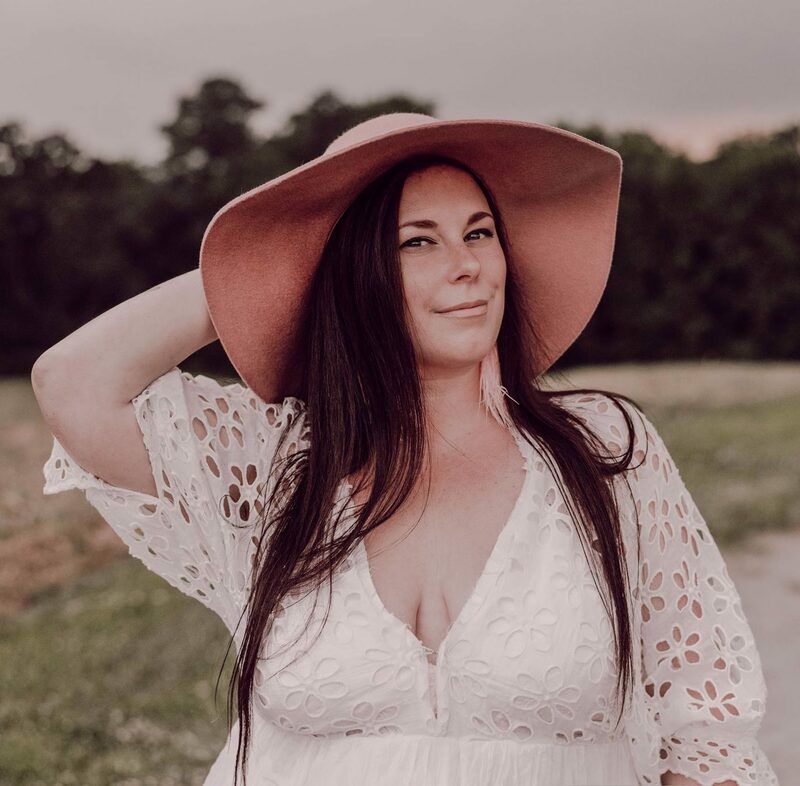 I love that you shared these tried-and-true affordable products–skincare doesn’t have to be intimidating! Some of these are the best classics! Noxzema and the Apricot scrub got me through high school! Great product suggestions, I have always especially loved St. Ives Apricot Scrub. and I have TERRIBLE acne so this was a nice read for me. 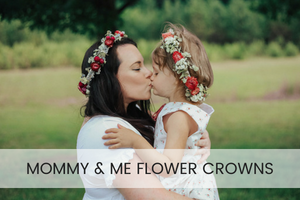 I am all about a good skincare routine these days, and these are some of my favorite products!